The opposition RJD-called shutdown in Bihar on Thursday to protest against the Nitish Kumar government's sand mining policy saw several trains being forcibly halted and roads blockaded by agitating RJD workers. The Rashtriya Janata Dal claims the Bihar government's sand policy has led to a sand crisis in the state and an over two-fold increase in the price of sand and also rendered thousands of labourers jobless. RJD leaders and workers, who claim they were joined by people, particularly labourers, hit hard by sand crisis, protested by blockading roads in the heart of Patna and nearby areas like Maner, Bihta. 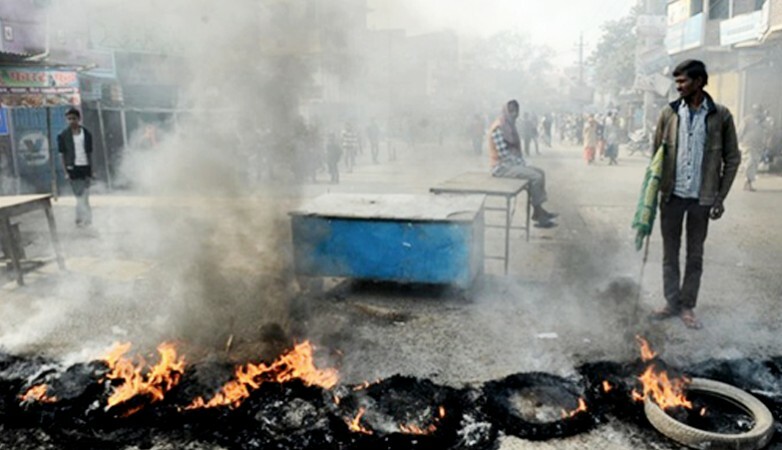 They also burnt tyres and shouted slogans against Chief Minister Nitish Kumar's government over its sand mining policy during the day-long shutdown. Protests were also reported from Gaya, Jehanabad, Nawada, Bhojpur, Saran, Vaishali, Aurangabad, Sheikhpura, Munger, Begusarai districts. RJD chief Lalu Prasad has said that party workers would ensure that Sikh devotees coming for the concluding Prakaash Parv do not face any problems during the shutdown. The new sand mining policy has resulted in a crisis since July and rendered lakhs of construction workers and others jobless, Leader of Opposition in the Assembly Tejashwi Yadav said, terming the policy "anti-labourer and anti-people". "RJD's shutdown has got overwhelming support of the people as the sand crisis is an issue that affects people," the RJD leader told media here. After joining hands with the Bharatiya Janata Party and forming a new government after dumping the RJD and the Congress, Chief Minister Nitish Kumar's government announced the new sand policy which it claimed was aimed at ending illegal sand mining and to regulate its sale in the state. The sand crisis has hit hard the construction sector and labourers for nearly five months. The new sand mining policy has led to an increase in sand prices from Rs 2,500 per trolley to Rs 6,600 to Rs 10,000 now, RJD leaders said. Early this month, the Patna High Court stayed the Mining Department's orders in connection with sand mining. On November 27, a division bench of Chief Justice Rajendra Menon and Justice Anil Kumar Upadhyay stayed the execution of the Bihar Minor Mineral Rules, 2017, introduced by the state government after the JD-U and the BJP came together on July 27.